• Standard rolls can be used in many formats. HolloWrap’s managing director David Paxton, and his staff, believes the new Hollowrap™ process – which cuts out the need for a cardboard core in the centre of every roll of film – will be a major success and will soon become commonplace. It is also expected to extend in to other areas of converting as the technology progresses. We monitor savings made by HolloWrap customers, broken down by industry type. 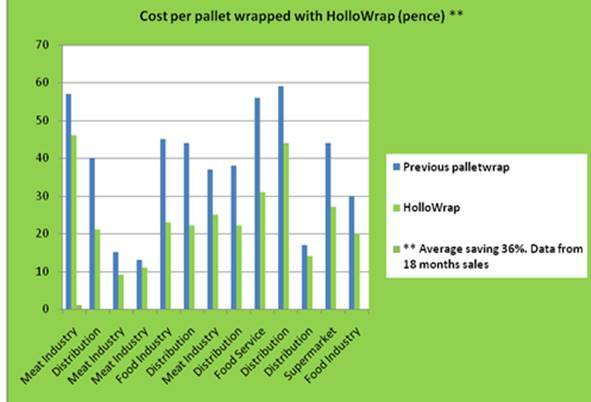 The average saving per pallet wrapped is 36% taking into account the yield per roll, wastage and price per metre. Average savings were using HolloWrap 14mu and the HolloWrapper dispenser. Something as intangible and difficult to control as perception can have a major impact on a business and the direction taken by an organisation. Over ten years ago, engineers at CGA came up with an innovative new design for a machine that could wind stretch and pallet film in a process that was new to the trade and would change the way people thought about stretch film and waste products. They created what is now a familiar term in the packaging trade, coreless technology. It was based upon a specially designed piece of equipment that enabled stretch film material to be wound under controlled tension on a patented mandrel. This mandrel could be activated for the winding process and deactivated once the wind was complete leaving a perfectly wound roll of material without the cardboard core that was, up until then, universally used in the process. The benefits were immediately obvious and not just to the company but to the trade. The savings made from eliminating cardboard waste and from the residual film left over on throwaway cores was easily between 10-15 percent of the product. This led to a new company being formed, and Hollowrap Ltd was born, such was the confidence in the product. The management of Hollowrap were looking to the future and saw coreless technology, supplied by CG Automatic Converting Equipment, as a ground breaking and bold move forward. We thought the packaging and warehouse industries would beat a path to our door once they appreciated the savings that were possible with this technology, not to mention the environmental savings it offered, says Managing Director David Paxton, and to some extent they did. Everyone we spoke to in the trade thought coreless stretch film was fantastic. However the potential of considerable savings and the additional environmental benefits proved to be a tough sales pitch and it took the next 3 years to get the product established in the market place. During this time Hollowrap pushed on with its developments and introduced its own range of re-useable dispensers. The technology was too good to give up on, despite the initial resistance to change explains David Paxton. So we pushed on and started to manufacture stretch film rolls in house using equipment manufactured by CG Automatic Converting Equipment. And the rest, as they say, is history. UK customers have now begun to embrace coreless technology, albeit slowly in the early days of the company, and sales are now being driven upward at around 20 percent per year. 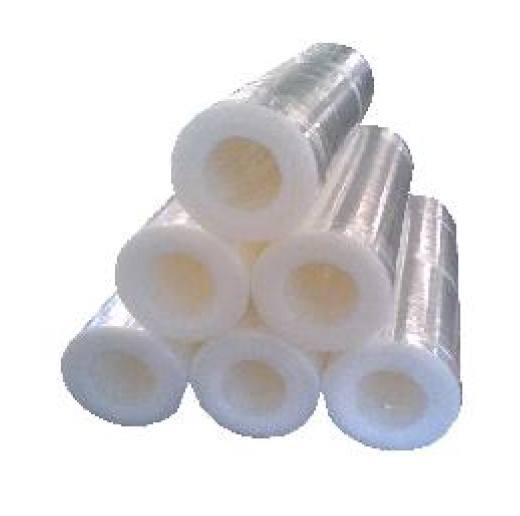 Hollowrap is now a national supplier of coreless stretch and pallet rolls to the UK market and although the UK remains the major focus for Hollowrap products the company is now getting great interest from customers around the world. Which all goes to show that perception can have a major impact on a business and the direction taken by an organisation. • Cost savings of 30% are not uncommon. • Hollowrap have remove over 60 tons of cardboard core waste so far. • Customers load stability has increased since using Hollowrap. • A 50% reduction in the film purchased has been achieved in some cases. • The bulk stacked option for our product removes even more waste. • The new Hollowrapper dispenser will bring pallet wrapping consistence to all users. You can check out our products by following this link here.